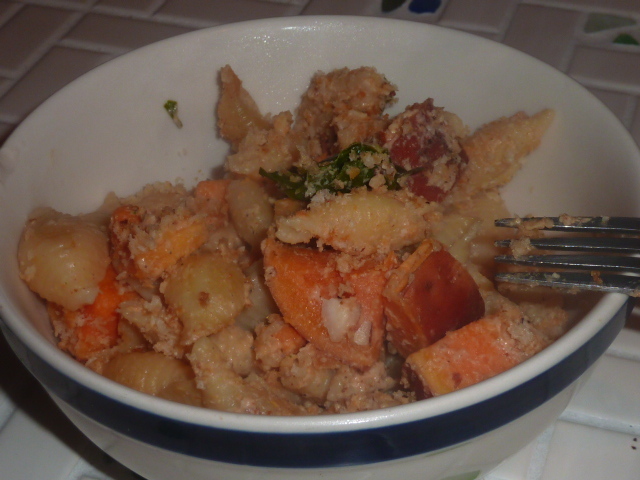 This is dish #2 in my attempt to creatively use sweet potatoes, which are not Zak’s favorite item. Nonetheless, we both really enjoyed this. The dish seemed decadent thanks to the bold flavors of the dijon, tahini, and sweet potatoes, but was actually very healthy. Just take a look at the nutritional facts for beet greens and sweet potatoes. Vitamin A galore! Substitute water for the milk and you’ll have a delicious vegan entrée on your hands. I was also impressed with how quickly and easily this dish came together. Basically, this is a new favorite way to use up sweet potatoes from the CSA. Bring two large pot of lightly salted water to a boil. In first pot, add sweet potato cubes and boil in salted water until tender, roughly 10-15 minutes. Add pasta to second pot and cook according to package instructions. 3 minutes before pasta is cooked, add chopped beet greens to boiling water. When pasta is cooked through and beet greens are tender, drain and set aside. Add milk, cashews, Brummel & Brown, tahini, 2 tsp. lemon juice, mustard, ginger, nutmeg, thyme, paprika, and freshly cracked black pepper to food processor. Pulse in 1-2 second bursts until mixture is smooth and creamy (roughly 15 pulses). Combine pasta, beet greens, sweet potatoes and sauce in a casserole dish and stir well to combine. Top with panko bread crumbs. Bake 15 minutes until hot and bubbly and panko crumbs are golden brown. This dish is amazing because it has all of the decadent creaminess and bold flavor of a cream and butter-based cream sauce with absolutely none of the guilt. It is a little bit time consuming, but it’s very difficult to make a mistake on. I had made the version from Aggie’s Kitchen months ago and fell in love with it, but just got around to adding my own “twist” to the recipe this week. I have a feeling variations of this dish are going to be a much more common occurrence in the kitchen, because this was so wonderfully delicious and healthy I could eat it all of the time. It also makes for great leftovers! In a large sauté pan, toast cashews until golden brown, shaking often, roughly three to five minutes. Add cashews to food processor and process until very finely chopped. Add 1 tsp. garlic powder. While processor is running, slowly add water. Scrape down sides. Pulse in one or two second bursts until cashew “cream” is smooth. It may be necessary to scrape down the sides a few more times as you are doing this. Add one tablespoon of olive oil to large sauté pan in which you toasted cashews and heat over medium heat. Add onions and mushrooms. Keep heat at medium and sauté onions and mushrooms, stirring very frequently, roughly 15-20 minutes until onions are lightly caramelized. Meanwhile, season chicken breasts with salt, pepper, and garlic powder. Heat olive oil in a large sauté pan over medium-high heat. Add chicken breasts. Sauté about seven minutes per side, until golden brown and mostly cooked through. De-glaze pan with white wine vinegar and cover pan. Reduce heat to low or medium low and cook another 10 minutes or so. When cooked through, set aside and keep warm. To the onions and mushrooms, add cashew “cream.” Bring to a low boil. If the texture seems too thick, add a few tablespoons of water and whisk thoroughly. Add cooked pasta to pan and toss to coat with cashew “cream” and to evenly mix vegetables. Mix in chopped parsley, reserving a bit for garnish. Slice chicken breasts widthwise into 1/2″ thick slices. 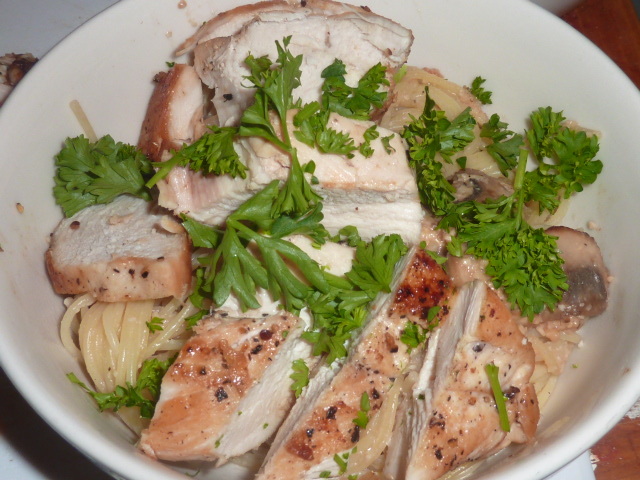 Top bowls of pasta with chicken slices and a few pinches of chopped fresh parsley.